PORTOLA HILLS LIVING by Kelly Turbeville: Should you buy a one bedroom condo? Should you buy a one bedroom condo? I recently helped a lovely client purchase his first home.. 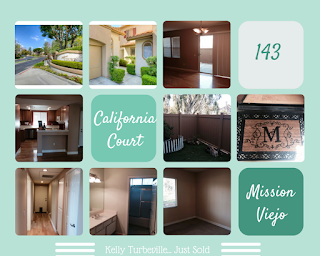 It was a 1-Bedroom Condo in Mission Viejo, California. As we were searching for his home, and when working with other home buyers, the question often comes up, "Should I buy a 1-bedroom", my answer back is always "why not?" Especially when working with first-time home buyers the question really isn't should I.. In South Orange County. 1-bedrooms average pricing is around $300k-$350k in today's market, so the real question comes down to affordability and should you buy now or wait. Another important factor to consider is the average rent for a 1-bedroom in South Orange County is between $1800-$2100/month. When working with first-time buyers, it is important to take special care to review all aspects of the real estate transaction: Affordability, Economic Factors and their current "Place in life".. Are they single, starting a family soon, settled in a career, etc. Once these factors are established and signs are a go, then really the final step is selection. Is this going to be your forever home probably not? However it can get you started on the strong economic path, certainly. Every market is different but many of my clients who have purchased 1-bedroom homes, have ended up growing enough equity to keep this home, renting it out as an investment property and still allow them to purchase their move up property. I do believe a key factor in purchasing a 1 bedroom is the amenities... Does it feel like a home... Does it have good resale value? There are five key amenities that insure this..
Take a peak at our resent sale at 143 California Ct. Mission Viejo. As you can see the five key amenities are all included and guess what our first time buyer loves it!! In summary.. if you are looking to buy your first-home and wonder if you should consider a 1-bedroom, make sure to review a rent vs. buy analysis, plus the pros and cons of buying now vs. waiting with your agent. I believe the results may surprise you. Happy home shopping and of course if we can help, please do not hesitate to contact Kelly Turbeville..